In spite of its metallic grey-to-black colour, stibnite connects more with the Sacral Chakra than the Root, and promotes inner stillness and centring. The energy is subtle, and although rod-shaped crystal can be used as wands, fibrous crystals are not particularly directional. It has some effect on both the Solar Plexus and Throat Chakras, and gently touches both the Heart and Third Eye. It allows spiritual opening while remaining ‘present’ and aware. Stibnite forms in hydrothermal veins, hot spring deposits, and low temperature replacement deposits, often in association with quartz, and with other sulphides such as galena, realgar, orpiment, pyrite and cinnabar. Crystals are prismatic with striations, and usually have an acicular (radiating) habit. It is the primary ore for antimony, which is used to harden lead in soldering and industry, and its compounds are widely used in flame retardants. Antimony also creates the blue colour in fireworks. 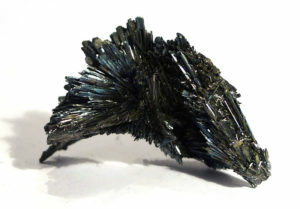 Stibnite is potentially toxic. Don’t place it directly in water when making a gem essence (use an indirect method), and wash hands after handling.